It was just last issue in our Belle Antique label overview that this writer said something to the effect that since all the best tracks from Kenso's first eponymous LP had been included as bonus tracks on the second Kenso II, that this hopelessly rare album would probably never be reissued. No sooner had #9 gone to press, I heard that it indeed had been reissued! 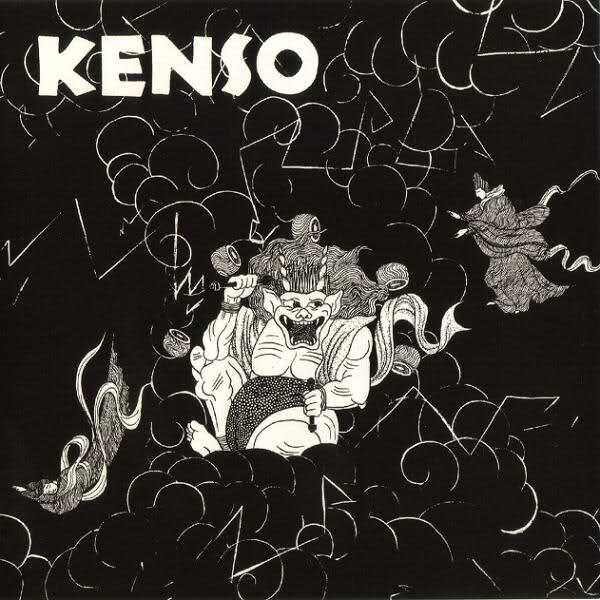 Most who are acquainted with Kenso's music are familiar with the mid-to-later period albums Kenso III and beyond, when their style took on a sort of Canterbury/fusion characteristic — indeed, at that point they could be thought of as a Japanese Hatfield or National Health. Some may know that the band's first two releases (and the compilation Self Portrait), and especially this first one were strongly influenced by Japanese traditional themes, which give it a very unique flavor; the song "Umi" is perhaps Kenso's greatest achievement along these lines. "Inei No Fue" and "Nihon No Mugiuta" also posess a strong link to the soul of Japanese culture. "Buchan No Chugaeri" at a little over a minute is a vocal adaptation of some Japanese folk/classical theme. The remaining tracks are not so strong along these lines: "Furiosareta Yaiba" is a more straight-ahead rock vocal track, and "Kagome" is essentially a sixteen minute avant-garde freak-out, beginning with some muted vocals behind a backdrop of synths, followed by screeching and howling and later churning taped sounds twisted into something of a sound collage. But it's the six bonus tracks that will take the listener all the way back to the origins of the band: an early live version of "Umi" is followed by four shorter studio tracks that range from good progressive instrumental jams ("Shijunsetsu No Tabi") to hard rock songs with vocals ("Kasukanaru Shido") — be glad that Kenso grew out of this phase! Perhaps the most interesting of the bonus tracks is the earliest; "Tabiji" from 1976 sounds almost exactly like the British band Family circa their Anyway album, complete with a Roger Chapman style vocalist and a rippin' guitar jam. Overall, this CD reissue will probably interest the collector and historian, but most of the material here (that hasn't already appeared on Kenso II) is very out of character in the overall context of Kenso's larger body of work.